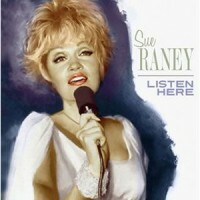 Description: Veteran singer Sue Raney's latest, released by SSJ Records of Japan, is an intimate duo album with great pianist/arranger Alan Broadbent. The two have a long history of successful collaboration, beginning with Raney's 1988 album Dreamsville and continuing on to her last album Heart's Desire. Listen Here succeeds on many levels. Raney's singing is gorgeous and Broadbent's accompaniment is beautiful. The song selections that include several lesser-known but attractive songs in addition to well-known standards, are also a plus. Recommended! Recorded August 26 and 27, 2010 at Umbrella Media, Chatsworth, California.